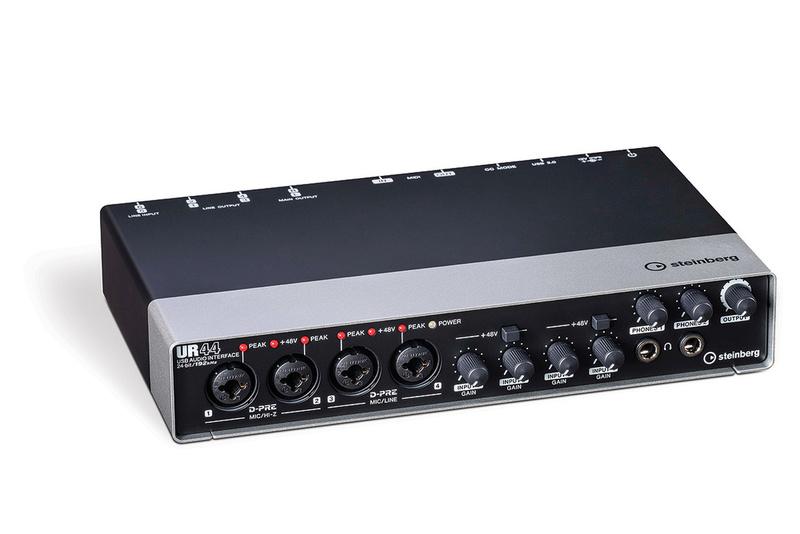 The UR44 is the latest addition to Steinberg’s roster of audio interfaces, providing a definite step up in specification from the small and capable UR22 we looked at in June 2013 (see www.soundonsound.com/sos/jun13/articles/steinberg–ur22.htm). It features the same Yamaha D–Pre microphone preamps as the rest of the range (which are also found on Yamaha digital mixers) and a maximum sample rate of 192kHz. When compared to the UR22, the UR44 offers more inputs and outputs (six ins and four outs) plus a flexible low-latency monitoring system with effects. 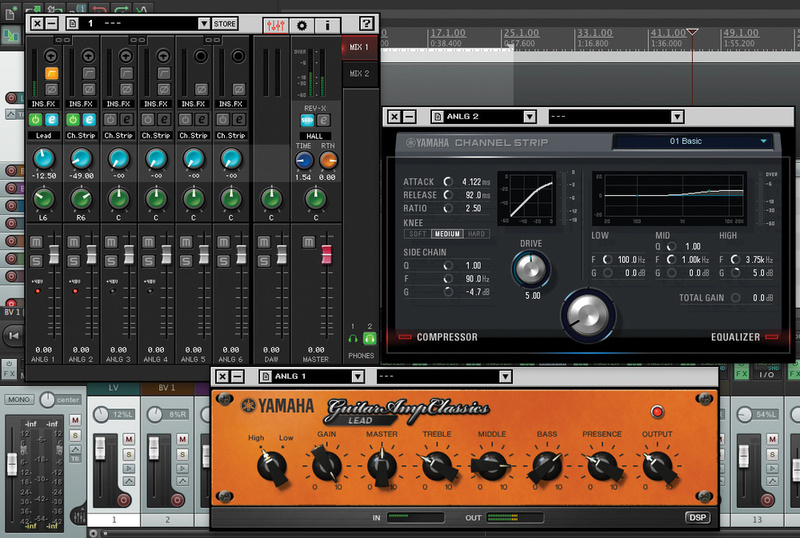 The package includes the Yamaha DSP bundle, comprising the REV–X reverb, Sweet Spot Morphing Channel Strip compressor/EQ and the new Guitar Amps Classics amp simulator, plus a basic version of Cubase. iOS compatibility is achieved through the use of an appropriate Apple Connection Kit, making it an interesting option for music-making on the iPad. Just like the more diminutive UR22, the UR44 is packaged in an incredibly sturdy metal case, sporting the ever–popular brushed aluminium and black finish. The build quality and paint job really do eclipse other interfaces at this price. The unit is nicely weighted, whilst switches and pots feel positive and abundantly hardy in use. Chunky rubber feet beneath the case and handy labelling of connections on the top round things off nicely. The interface is powered by a wall–wart DC adaptor, which is included alongside a USB cable with a removable ferrite core. As with other larger USB audio interfaces, bus powering is not an option, which might constitute a limitation for those interested in location recording. Starting with the front panel, four Neutrik Combo connectors give access to the D–Pre mic preamplifiers. On the jack front, inputs 1 and 2 are set at instrument level for guitars and bass, whilst inputs 3 and 4 are line level (either unbalanced or balanced). Above the Combo sockets is a series of LEDs: a peak indicator for each input as well as phantom power and mains power. It perhaps would have been nice to have multi–coloured LEDs here to show input activity as well as input overload. To the right of the four input connectors are the gain controls. Such a layout is neat when the various cables are plugged in, and also allows for more accurate gain matching between channels. Phantom power switching is in pairs — a welcome feature if you need to connect anything that doesn’t like it — and although there is no pad switch, a high–pass filter and polarity switch are accessible via software control. A monitor section follows, with volume controls for two independent headphone mixes plus the master output. Around the back, two further line inputs are provided and, usefully, these can be switched in sensitivity between +4dBu and –10dBV. There are four line outputs here, and two additional main left and right line outputs that carry the same signals as outputs 1–2. Such a specification is handy for users wanting to connect a second set of monitors, but as an engineer who regularly dabbles with surround mixing, it would have been nice to have six independent outputs to make the interface even more versatile. I suppose this decision makes sense when comparing the specification of the UR44 to the larger UR28M (which does have six outputs), but I will continue to keep this on my wish list! Another omission that sets the UR44 apart from the UR28M is the lack of digital I/O, which could prove problematic for those wishing to connect external equipment using S/PDIF, for example. MIDI In and Out connections and a switch for class-compliant (iOS) operation complete the back panel line–up. As with other Steinberg products, getting started involves a number of steps and user registration. The interface is boxed with a ‘tools’ disc containing the USB driver, the ‘dspMixFx’ software control application and the DSP effects. This software — plus subsequent updates — is also available from the Steinberg web site, for those who don’t have an optical drive. The DSP effects need to be activated before use, and this is achieved by first launching the installed ‘eLicenser’ application and entering the serial number supplied on a licence card. Two additional line inputs are located next to the four line outputs on the rear panel. A further Main LR pair of line outputs carry the same signals as outputs 1–2, so that two sets of monitors can be connected. MIDI input/output is present, as well as a class-compliant mode switch for use with iOS. Power is by means of a 12 volt external supply.Cubase AI is downloaded directly from the Steinberg web site using the code from a second licence card. User registration is required, and the install is very sizeable at around 3.4GB. Following investigation, it was revealed that such substantial size is due to the standard installation including over 2.5GB of content that isn’t even used by the free version of the software! I assume that this is related to the special offer upgrade to Cubase Elements that is advertised when Cubase AI is first used, but it’s extremely presumptuous of Steinberg to assume that users would like to have the content there ready for a potential upgrade. Frustratingly, the content is fairly difficult to remove manually afterwards, so users would benefit from clearer information on screen at the installation stage. To negate this issue, ‘Custom Install’ must be selected and all content options unchecked, ensuring that only data pertaining to AI only is copied to the hard disk. The firmware can be easily updated at any time via the Information window within the dspMixFx software . Clicking ‘Check For Update’ here will search for firmware and software updates and then apply them. Those wishing to use the UR44 with an iPad require firmware version 2.1 or later. A colourful dspMixFx application is provided to set up foldback mixes and control other hardware features on the interface. This software is to be used with audio applications other than Cubase, and is presented as a virtual mixer panel with a reassuringly intuitive layout. On the left–hand side of the mixer panel, each input is represented as a channel with volume, pan and mute/solo controls, plus a polarity switch and high–pass filter (inputs 1–4 only). DSP effects can be added to signals in the foldback mix as inserts, but typically the blue send knob is used to effortlessly add a touch of reverb to incoming signals. The master section on the right–hand side features master output faders and meters, and an effects return to specify the reverb algorithm being used and control reverb time/return level. Two independent headphone mixes can be set up by toggling the Mix buttons, and all settings can be simply stored for later recall. By pressing the Set–up button at the top right-hand side of the window, users can access additional hardware settings, including sensitivity switching for line inputs 5–6 and to change the high-pass filter frequency for the first four inputs. 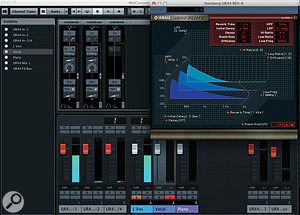 The dspMixFx software (top left) working in conjunction with Reaper. The Sweetspot Morphing Channel Strip and Guitar Amp Classics plug–ins are also pictured, in this case being used to provide low-latency effects on the foldback mix.An iPad app version of dspMixFx is also available and can be downloaded once the firmware has been updated. The app works alongside other iOS audio apps to provide the same functionality as described above. Used creatively, the app can alternatively act as a digital mixer for a live session or rehearsal, for example with microphones running through the reverb, EQ and compression, and guitars passed through the amp simulator. Cubase AI 7 features 32 audio tracks, up to 16 virtual instrument tracks and an updated graphical user interface. Notably, version 7 allows the use of sample rates above 96kHz, and so constitutes a more useful recording package than previous versions (which were limited to 96kHz). A limited Halion Sonic SE sound set is available, consisting of General MIDI timbres plus a handful of pads and synths. 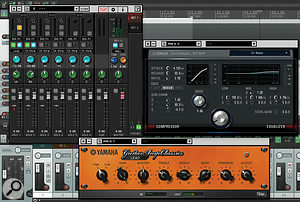 The 28 stock audio effects are also basic, but are complemented nicely by using the VST3 versions of the bundled plug–ins on inserts and sends. The REV–X plug–in is a parameter–rich digital reverb from Yamaha, whilst Guitar Amp Classics offers a variety of usable tones and simple user interface. Likewise, the Sweet Spot Morphing Channel Strip offers a pleasant-sounding EQ plus more detailed control of compression parameters than the stock dynamics plug–in (for instance, higher compression ratios are available). Cubase AI integrates DSP monitoring controls for the UR44 into its native mixer panel, so the dspMixFx software is not required when using Cubase. 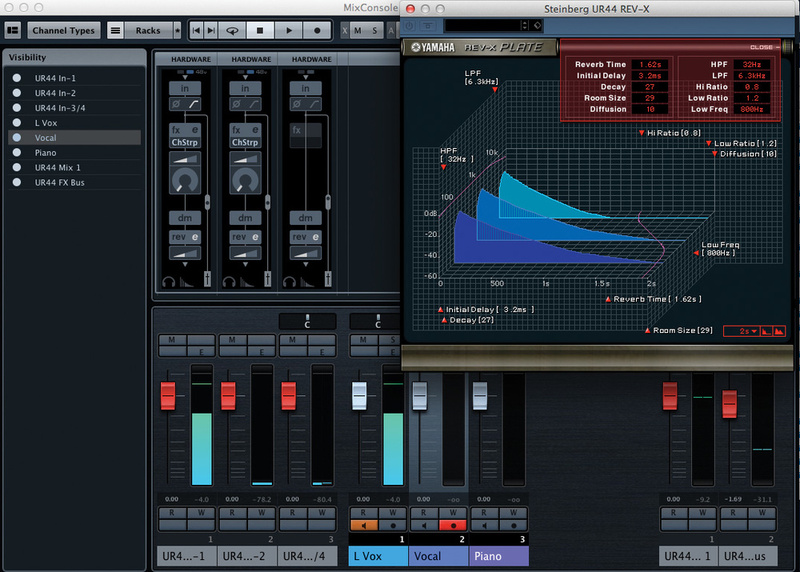 Using the UR44 with my DAW of choice (Reaper) was a delight and yielded excellent results. Simple hardware controls combined with the intuitive layout of the dspMixFx made it incredibly simple to plug in microphones and manipulate the sound coming from the headphones to my liking. Plenty of gain was available to the microphones (up to +52dB) and again, I found the D–Pre preamps to be low in noise and transparent. Adding reverb on the foldback mix really allows the instruments being recorded to work in context with the other tracks playing back, whilst panning the inputs helps to separate them in the headphones, particularly in a self–operation situation where a number of inputs are being used by the performer/engineer. The only down side to all this was that I was unable to access the VST3 versions of the bundled effects plug–ins for mixing, since Reaper does not support this standard. Meanwhile, in Cubase AI, a UR44 template provides a useful starting point for a recording project. Use of a template is key to getting the device’s inputs and outputs active and direct monitoring switched on, but annoyingly, some fiddling with the VST Connections panel was still required to get inputs 5–6 up and running. Seasoned Cubase users will not be fazed by this, but the way in which inputs and outputs are accessed isn’t at all obvious for the beginner. The re–designed Cubase mixer panel displaying the UR44 direct monitoring controls in the top section for the first three mixer channels (which correspond to hardware inputs). The REV–X digital reverb processor is also shown and offers a good range of adjustable parameters.When using any of the Cubase variants, control of the foldback mix and DSP effects is integrated into the software itself, so there’s no need to use dspMixFX (which in fact will not function whilst Cubase is running). Far from making the process more streamlined, I found the somewhat cryptic graphics on the Input Settings and Hardware Control panels within the Cubase mixer to be less intuitive than the dspMixFx user interface. Furthermore, it took me a while to get going, as the default horizontal zoom setting on the mixer rendered many of the direct monitoring controls invisible, a confusing situation that was only rectified by undertaking an Internet search to find out the keyboard shortcut for zooming out in the mixer (‘H’ on the keyboard). However, once these hurdles were overcome, Cubase AI did do everything I needed for recording, editing and mixing some audio tracks, whilst also providing some passable string pads to layer up the mix. If you don’t own any other DAW software, Cubase AI does represent a worthwhile option when starting out, if only to access the VST3 versions of REV–X and the other bundled plug–ins for mixing duties. Summing things up, the Steinberg UR44 is a high-quality and sturdy four–input interface with flexible direct monitoring features, decent-quality bundled plug–ins, and a basic DAW to get you started. The dspMixFx software works incredibly well when working alongside external software, but it’s frustrating that this cannot also be used when recording with Steinberg’s own sequencers. This package will fit the bill for those who want to record more than two simultaneous inputs at high sample rates using analogue inputs, or those wanting to switch between computer and an iPad rig with minimal headaches. The UR44 is well worth a look! The Focusrite Scarlett 18i8 is a slightly more expensive option. It features a greater number of line inputs than the UR44, plus SPDIF I/O and ADAT optical in. Software–controlled direct monitoring and two separate cue mixes are present, but doesn’t include any DSP effects processing. In use, I’ve found the mic preamps to not be nearly as clean as the Steinberg’s, and maximum sample rate is set at 96kHz. The Akai EIE Pro is a fantastic budget option. It has broadly similar features to the UR44 with retro styling, VU meters and bonus features including insert points and USB hub. The preamps don’t match the quality of those on the UR44, and there is a simple direct monitoring system that doesn’t have software control or effects. Sister company M–Audio recently launched a re–boxed version of this interface called the M–Track Quad. Four D–Pre mic preamplifiers with Neutrik Combo connectors. Two instrument jack inputs on Combo connectors, two TRS line inputs on Combo connectors. Two further TRS line inputs. Four TRS line outputs, plus Main LR line outputs (which yield same signals as line outputs 1–2). Requires Mac OS 10.7 or 10.8, or Windows 7 or 8 (32– or 64–bit). Compatible with iOS (requires an Apple Connection Kit). Comes with Cubase AI Elements 7 (via download), REV–X reverb, Sweet Spot Morphing Channel Strip & Guitar Amp Classics amp simulator. Supplied with DC power adaptor & USB cable. Easy operation and flexible DSP direct monitoring with dspMixFx. Unused installed software steals lots of disk space! Integrated direct monitoring within Cubase AI is not as intuitive as using dspMixFx software. Despite minor shortcomings, its decent audio and build quality, simple operation and capable low–latency monitoring features make the UR44 a worthy contender in the four–input USB 2 audio interface market.